The idea of a technological “Singularity,” that is, a point where humankind essentially merges with technological systems to create a super-human intelligence, has become a hot topic these days. 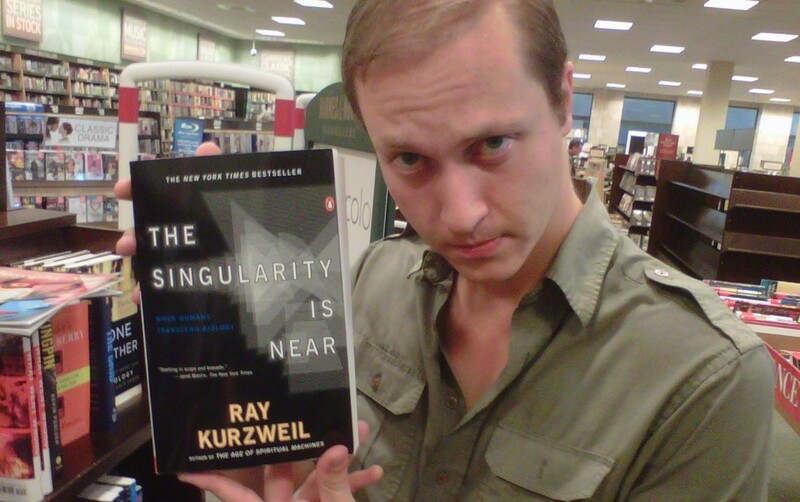 While the general concept has been around for the better part of the last century, these days it is most often associated with inventor and transhumanist advocate Ray Kurzweil, whose book The Singularity is Near (pictured above… it’s the one on the left, by the way) represents the most comprehensive work on the subject. Indeed, as the title above already suggests, it was none other than Jacques Vallee, ufologist and computer scientist, who expounded on ideas quite relevant to technological Singularity in a scientific journal as early as 1975. An essay, co authored with Professor Francois Meyer in the year mentioned, appeared in the journal Technological Forecasting and Social Change under the title “The Dynamics of Long-Term Growth” (and note that, among Vallee’s credentials, no mention of his UFO research is made). The ideas expressed were very similar concepts to notions of Singularity expressed by Kurzweil and others today, though the term “Singularity” was never used specifically. This article not only described concepts similar to what Kurzweil refers to as the “knee of the curve” (regarding faster-than-exponential growth of technology in relation to human evolution), but also a projected year of 2026 for what the authors called a “singular point.” Kurzweil predicts this point will be reached in the year 2029… still in the same ballpark, at least. English mathematician I.J. Good touched on the similar concept of “Intelligence Explosion” again in 1965, and then science fiction writer Vernor Vinge (also a mathematician) went on to write about what he called “a kind of singularity” in an editorial for Omni Magazine in 1983, and thus arguably popularized the subject in the modern sense. It’s interesting, however, that neither Wikipedia, nor Ray Kurzweil so far as I know, mention Vallee and Meyer’s contribution to this subject, which at least seems to have pre-dated Vinge’s ideas by nearly a decade. Unlike the more optimistic attitudes toward Singularity expressed by many in the transhumanist camp today, things get a bit dark toward the end of Vallee and Meyer’s treatise. In the “discussion” section toward the end, the authors note that, “the forecast of infinite growth in a finite time interval is absurd. All we can expect of these developments is that some damping effect will take place very soon. The only question is whether this will be accomplished through ‘soft regulation’ or catastrophe.” Wondering aloud here, what could “soft regulation” be compared to here? Orwellian micro-management of a populace? Geo-economic collapse? (I say this partially in jest, though I’d like to know what the authors really meant by this statement). Catastrophe, on the other hand, might possibly represent the harmful after-effects of an EMP weapon, or even coronal mass ejection by the Sun, which would cause similar effects globally (both are subjects I’ve addressed in the past here at TGR). I’d be interested in hearing Vallee’s ideas on what this “mechanism” for potential decrease might be nowadays, given the present geo-economic forecast, as well as NASA’s concern with harmful potential of solar irradiation that focuses on the year 2013… or as Vinge alluded, the ever-present concerns surrounding nuclear proliferation. Could it be that the sorts of technological Singularity proposed by Kurzweil, Vallee, Vinge, and so many others may never be realized, due to impending conflicts that could await us in the future? Maybe the “soft regulation” might be something more akin to the antidoping laws in sport competitions. Personally, the thing I find most abhorrent about the Singularity, is that with our present state of affairs it will do nothing but turn the gap between the rich and the poor into an impassable chasm. Although it wouldn’t have surprised me if he had, I don’t think Vallee’s paper was addressing (or pre-empting) the ideas of Kurzweil or Vinge. His references to technology were to show how the hyperbolic growth rate of human populations were analogous to technological development. Those 60s were a great place with over-population being as big a concern as de-population by the idiots with bombs. The ‘singularity’ that was concerning he and Myer was the mathematical point when a data set no longer makes sense or can be predicted. In this way, diminishing land availability and growing populations would hit a ‘singularity’ in 2026 and present a sort of event horizon beyond which statisticians could not see. Luckily for us, the hyperbolic trajectory didn’t hold and fell away in the 70s. Otherwise we’d be 15 years from that twilight Zone episode where people lived shoulder to shoulder! I don’t think anyone can predict the future, or our future, with mathematical models but they can act like a growl in the darkness and warn us of danger. Over-farmed, over-fished, over-populated etc – what else? Chances are we’re looking at a few singularities that will turn hyperbolic curves into zig-zags and flat-lines. The technological singularity could be a lot later than people like to think and solely for the mega-rich and powerful. I would agree that Vallee certainly wasn’t preempting Kurzweil’s and Vinge’s theories… however, many of the points addressed (while as you’ve illustrated, they do obviously address issues such as overpopulation, illustrated concisely in the introduction), also illustrate parallels very similar to later, more directly pertinent ideas involving technological singularity. So in all probability, the essay from 1975 was indeed dealing primarily with population growth, and how technological growth works with that… but all these things were nonetheless the beginnings of Vallee’s own predictive interpretations of a coming Singularity. Hopefully the interview linked in this comment thread helps illustrate that more clearly, and that you enjoy Vallee’s insights (again) as much as I so often do. Thanks for you insights Kandinsky, and thank you RPJ for linking that comic for us also! Bostrom’s “Transhumanist FAQ” gives cogent answers to many of the most central ethical questions regarding Transhumanism. Personally, I have some grave reservations about AI and Singularity, but I think most Transhumanists have similar concerns as well. In any event, many common objections (especially those of the knee-jerk variety, a reaction which is entirely understandable in this context) to Singularity have already been answered in the literature, and the above pdf file would be a good place to start when delving into the serious and real ethical and philosophical questions involved in this delicate and obviously controversial subject. Thank you so much for the PDF link! It raises very interesting points re. how technologies that are first exclusive to the very rich slowly become accessible to the classes below. This however, is the best-case-scenario. It does not take into account how governments will try to control the access of those technologies in order to maintain the dominance of the Status Quo. The events witnessed this year during the ‘Arab Spring’ is the best example of this –already there are attempts in my own country (Mexico) to enact laws that would suppress the liberties of ‘dissenting’ Twitter users. The idea that singularity has already been accomplished by future machine integrated human beings, via an implicate order based technology, is somewhat great science fiction, but greatly lacking in practicality IMO. It fails to account for the “reason” to construct or manipulate such a past no matter how bleak the future might be. If the spacetime that our conscious minds are presently oriented to and with, is of an implicate order technology based construction (a virtual program in which we participate), accomplished by human machines, where is the world from whence these human machines came from originally if that same world is not ours? This idea or notion also fails to account for why such a human/machine hybrid race would want to construct such a past when in reality, according to implicate order, they could just as easily rearrange their own present. Via their hypothetical implicate understanding, cannot they simply create consciousness within an ideal spacetime construct most suited to their present needs? Why would human beings using machine based intellectual prosthesis want or need to appear different from human beings that could interact with past mankind on a completely familiar and tangible level while remaining as discrete as is deemed necessary by themselves? Personally, I find it far more logical to navigate the hypothetically imagined pathways of ongoing, self contained yet possibly externally altered or effected, sentient evolution. This being a natural and necessary part of our ongoing survival as a specific spacetime native of this far larger than imagined environement. Especially considering how much genetic and physical change evidence exists to bolster such a notion presently, as fantastic as it all may be or seem. 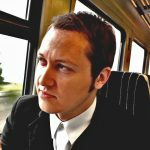 @ Micah – Thanks for the interview link; it’s one I haven’t heard before although very much along the lines of chapter 6 in his ‘Network Revolution’ book.